We’d love your help. 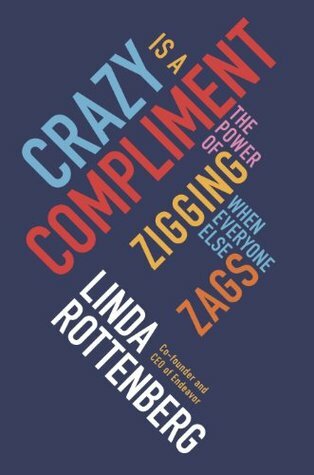 Let us know what’s wrong with this preview of Crazy is a Compliment by Linda Rottenberg. These days everybody needs to think and act like an entrepreneur. We all need to be nimble, adaptive, daring - and maybe even a little crazy - or risk being left behind. But how do you take smart risks without risking it all? Crazy Is a Compliment combines inspiring stories, original research and practical advice to create a road map for getting started and going bigger. It brings to life iconic entrepreneurs like Walt Disney and Estée Lauder, reveals how companies like GE and Burberry have broken the corporate mould, and introduces us to entrepreneurs like Leila Velez, who started an $80 million hair-care company from her kitchen sink in Rio. Whether you're serving coffee and fantasizing about launching a microbrewery or sitting at your desk brainstorming a new idea that can improve your company, Linda Rottenberg provides a road map to getting started, going bigger and achieving your dreams. To ask other readers questions about Crazy is a Compliment, please sign up. Linda gives great insight into the world of entrepreneurs - a lot of interesting stories, advice and insight from her own experience as well as others. A well written, encouraging but realistic, and most of all, enlightening book that brings together and builds upon many many books and publications written on entrepreneurship prior to Crazy Is a Compliment. An excellent guide to things you should be aware of and follow through on if you're planning on starting a business, or already have one. This book isn't a usual business book but more like an inspirational book for would-be entrepreneurs. It talks about real life stories of entrepreneurs and how they became successful in their endeavours as well as potential pitfalls that one needs to be aware of - made this a truly enjoyable read. For eg: 3M employee who invented Post-It Notes, which eventually went on to become one of 3M’s biggest selling products. Great tips on forming an entrepreneurial culture in an organization. Its a good This book isn't a usual business book but more like an inspirational book for would-be entrepreneurs. It talks about real life stories of entrepreneurs and how they became successful in their endeavours as well as potential pitfalls that one needs to be aware of - made this a truly enjoyable read. For eg: 3M employee who invented Post-It Notes, which eventually went on to become one of 3M’s biggest selling products. Great tips on forming an entrepreneurial culture in an organization. Its a good reminder for would-be entrepreneurs who might lack connections to elite networks and don’t have trust funds as a safety net but what you should possess is chutzpah!! No new insights - I would say the author summarized pretty commonsensical principles and threw case studies and narratives in as examples, but still a pretty blah book overall. Good look at taking risks and looking at the world not like it is but as it could be. The spoiler would be - don't read this if you don't want to think about changing you life. I liked it so much that I listened again! Linda does a great job of getting inside the heads of those that are looking towards the future and gives examples that are fresh and not the same old same old that one reads in many similar books. In addition, she does put herself on a pedestal to stroke her ego. She appears to be writing this book to simply share what she has learned over the years. It really is an excellent book and if one has hopes and dreams of building a company or changing how the world work I would highly recommend this book. The only part I wished was discussed more was how the "crazy" deal with describing to others what they see in their heads. The "crazy" see many things differently, but convincing others to follow their path is quite difficult. Mainly because change is difficult or people simply cannot understand what the "crazy" people are trying to create. This book is one in a genre that aims to instill passion in persons encouraging them to follow their hearts and seek the path of entrepreneurship. The Author is a co founder of Endeavor , a global organization, that aims to promote business growth by working with businesses that are at a juncture of growth with the right resources. The book talks to these businesses and earlier stage business startups or persons contemplating starting their own businesses. The book outlines the importance of hee This book is one in a genre that aims to instill passion in persons encouraging them to follow their hearts and seek the path of entrepreneurship. The book outlines the importance of heeding dreams, having passion, managing risk, and facing critics. A book of many books. linda brings in a whole sh*t load of experiences and stories that would take someone forever to compress, but not for the superwoman who just keeps loading one huge anecdote after another, of successes, failures, disappointments and inspirations. She talks passionately about how the world-scene of entrepreneurship and intrepreneurship is changing continually, and what it means for everyone, be it a startup, a NGO, an employee, someone unemployed ... everything. It does seem A book of many books. linda brings in a whole sh*t load of experiences and stories that would take someone forever to compress, but not for the superwoman who just keeps loading one huge anecdote after another, of successes, failures, disappointments and inspirations. She talks passionately about how the world-scene of entrepreneurship and intrepreneurship is changing continually, and what it means for everyone, be it a startup, a NGO, an employee, someone unemployed ... everything. It does seem to wrap around a saleable course type of format, with keywords and sections like a coursebook, but that may be the intention of such an author. An enjoyable book through and through! I love how Linda Rottenberg read it, enjoyed all the anecdotes she cited and appreciated all the the insights she shared. What a wonderfully comprehensive gift to entrepreneurs (and all readers). I will definitely come back to it again and again, and share her words of wisdom. I have a newfound respect for Endeavor and hope to be an Endeavor entrepreneur one day. My kind of community development. Having recently finished my MBA and having been an entrepreneur myself with a restaurant and national supply business for a franchise, I found many insights to things I wish I had tried. There was a great chapter of mentoring and how just seeking 1 is not enough. I also liked the thought of seeking many at all levels up down and around and that the mentors change change as you change and grow. Very insightful and something that even in my corporate role today I should be doing more of. There's not a lot new to me in this book, but it's very well written (and I read a lot anyway, so for many it wouldn't be redundant at all). It's for people who are considering breaking out of the rut into entrepreneurship and for people who have taken the leap and are trying to stabilize. It's got both practical methods and some great personal self-management. A great read if you want to build a different life for yourself. Libro bastante cliché. Como menciona a lo último es como un gran resumen de muchos otros libros de emprendedores. Está bueno en cierto punto porque cuenta muchas historias no tan conocidas de emprendedores pero el su gran mayoría no es nada nuevo. No deja de mencionar el hecho de que la cultura es más importante que el salario, cosa que creo que está haciendo mucho mal en el ecosistema emprendedor. Based on my friend's reading recommendation, I tried this book. And yeah I love it. Linda shows the reader all the important steps in the process of entrepreneurship. Her company, Endeavour has helped many entrepreneurs and their stories are such an inspiration. No matter big or small, the 'entrepreneurship' skills are important. A great read for independent thinkers who tend to march to their own drummer rather than being easily swayed by conventional thinking, public opinion, current trends and pop culture. People throw the term "crazy" around with increasing frequency about anyone who is different from what they're used to, or has a different outlook/response. Applies to both career and personal life. Recommend. This would be a 4-5 star for someone new to the topic of entrepreneurship, but only a 2-3 if you're well read on the subject. This is a well-written book, but I didn't get much out of it because I had read so many of the sources that the author used to populate this book. Spoiler alert, the last chapter is a beautiful love letter to her twin daughters. Linda Rottenberg has crafted a wonderful guide with practical no-nonsense tips for idealists, dreamers, and creative thinkers. A quick and engaging read that I have recommended to others. Enjoyed reading this more than I thought I would. Thought it would simply rephrase a lot of ideas I already knew about entrepreneurship and Endeavor but really it is much more. The book is loaded with great anecdotes and storytelling making it easy to read and insightful. Thanks Linda. It was a great book. While I am not in business or an aspiring entrepreneur I found the things discussed in this book to be molded to fit into my everyday life and where I see my career going. Definitely a must read for anyone in the workforce. Excellent book for would be entrepreneurs of any type. Thoughtful and packed with practical advise. nothing new. a quick read with some catchy phrases. Excellent Book. I could relate to 80% of the book. Very motivational for an entrepreneur. Nice set of stories. Good stories, easy read. Linda has had a hell of a professional life.